Woozworld is a Free to play Social MMORPG genre game, developed for Woozword Inc for Internet Browser games. In whose world players are able to embrace a second life in this free to play social MMO, creating their own unique Woozen avatar they can explore the colourful world that is designed for children and young teens aged between nine and fourteen. 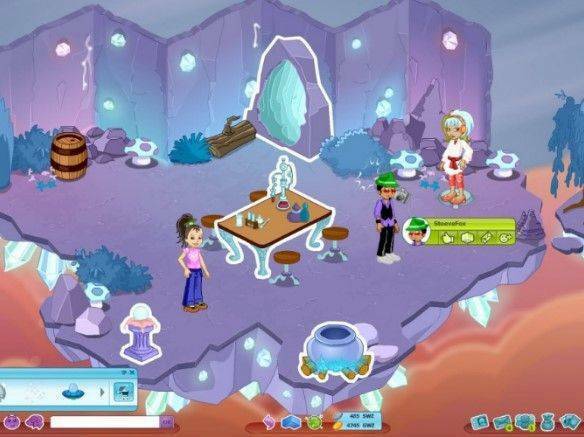 Many elements of the game is designed by the players themselves allowing them to create their own unique Unitz, fully designed and decorated areas, meet new players and make friends and play through various MMO style quests as well as playing hundreds of built in mini games and watching various videos. Players start by creating their own Woozen, choosing either a male or female avatar they are able to personalise them with various looks, hairstyles and clothing items that can be used to recreate styles of various celebrities, recreate yourself in a digital world or be the person you always imagined. When creating a new Unitz players start by choosing from a list of different shaped rooms and can select everything from theme, colour and background to create the environment they want. From here they are able to decorate their grid map with various items and objects, anything from doors, lamps to alien craters; there is something for every theme you can think of. Items and Unitz are purchased with Beex, the games in game currency, which can be earned through gameplay and simply exploring the different features of Woozworld. Players are able to play various mini games with each other to help make new friends and can even add them to their own social friends list so they can always be in touch when online. Players can get involved in various crafting activities such as Woozworld’s FoodZ where you can make your own food and serve it up in your restaurant Unitz and let other players visit you and purchase your items like a real business! There are events constantly run by the game’s developers such as various parties and festivals held in game that players can join to have form, meet new people and even earned prizes and in game Beex. The developers place a huge importance on the safety of their players given that it is a game made for children and young teens and so fully conforms to the “Children’s Online Privacy Protection Act” which protects children’s personal information and ensures peace of mind for parents.